Update 1.87 "Locked On" (changelog) was introduced on 12 March 2019. The update is notable for the introduction of radar mechanics, French helicopters, and Rank VII ground vehicles. Location for naval battles "Coral Islands". Location for ground battles "Alaska". New naval missions in the "Encounter" mode: Norway, Mediterranean port, and Black Sea port. Test flights has been refined. Additional air and ground targets have been added. The flight courses of the allied vehicles have been adjusted. Test flight locations for Italian and French jets have been reworked. Poland - Balancing changes in the south-western part of the map, which makes it impossible to fire upon some respawn points, have been implemented. The textures in sand have been adjusted to get rid of repetitive landscape patterns. Vietnam - Work on performance optimisation has been done. All reservoirs in the tank part of the location can now be crossed with vehicles. On the "American Desert" location, building destructibility has been added. Traffic lights and fences have also been fixed. New enduring confrontation map "Vietnam" has been added for aircraft and helicopters. Changes in base bombing logic - several can be active at once. Tasks are not given since base icons are shown on the map. Bases are now protected by high-calibre AA guns. AA guns have been added to all enduring confrontation missions. Regarding helicopters in enduring confrontation, landing site detection has been switched off, and helicopter landing sites cannot be destroyed. ZSU-23-4 — Radar station for sector search and target tracking has been added. A shell casing ejection animation has been added. Gepard — Radar station for circular viewing and target tracking has been added. A shell casing ejection animation has been added. М247 — Radar station for circular viewing and target tracking has been added. OTOMATIC — Radar station for circular viewing and target tracking has been added. M163 — Radio rangefinder and ballistic calculator have been added. A shell casing ejection animation has been added. Type87 — Radar station for circular viewing and target tracking has been added. Chieftain Marksman — Radar station for circular viewing and target tracking has been added. AMX-30 DCA — Radar station for circular viewing and target tracking has been added. B1 Centauro and B1 Centauro Romor — The hull destruction mechanics have been fixed and enabled. The vehicle will not be destroyed by critical damage related to breech, the transmission, engine or wheelbase. SIDAM 25 - A laser rangefinder, as well as optical tracking device simulation, have been added. 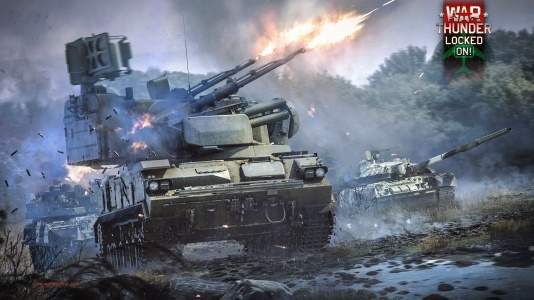 T-64B, T-80B - stock ammo has been changed from 3BM15 to 3BM22. 3BM42 ammo has been added. T-64A, T-64B - turret and upper front plate armour is now a single armour part with volumetric armour technology. The effective armour thickness is calculated as a distance between impact point and exit point. In armour view, there is a special tip for such parts - "armour dimensions at point" parameter is displayed. The degree of damage required to tear off and aircraft’s tail and wings has been corrected for all aircraft. Brake parachute application mechanic has been added for the following vehicles: G.91 pre-serie; G.91 R/1; G.91 R/4; G.91 YS; MiG-19 PT; MiG-19 S; Mitsubishi T-2; Super Mystere B2; S.O.4050 Vautour IIB; S.O.4050 Vautour IIA; Vautour IIA IDF/AF. La-200 — Target detection "Toriy-A" radar station has been added. MiG-19PT — Target detection and tracking radar station has been added. F3D — Target detection and tracking radar station has been added. Sea Venom FAW 20 — Target detection radar station has been added. P-61C-1 — Target detection radar station has been added. P-61A-1 — Target detection radar station has been added. Javelin F.(A.W.) Mk.9 — Target detection and tracking radar station has been added. Do 217 J-2 — Target detection radar station has been added. Do 217 N-1 — Target detection radar station has been added. Do 217 N-2 — Target detection radar station has been added. Me 410 B-6/R3 — Target detection radar station has been added. He 219 A-7 — Target detection radar station has been added. F9F-8 — AIM-9B missiles added. FJ-4B — AIM-9B missiles added. FJ-4B VMF-232 — AIM-9B missiles added. F-86F-40 (Japan) — AIM-9B missiles have been added. F-100D — AIM-9E missiles have been added. MiG-19PT — Р-13M missiles have been added. Ju 88 A-4 — separate 250 kg bomb drop added. Mi-24D — Flares and IRCM added. F7F (all modification) — armour plate position has been fixed. MiG-19PT - Armour thickness has been fixed. Mi-24P (Germany) — Flares and IRCM display has been fixed. Mi-24 (V and P versions) — armament presets after unlocking R-60M modification have been fixed. Bo-105 (all modifications) — New suspended weaponry (machine guns and rockets) and thermal traps have been added. Ki-200, Me 163B, Me 163B-0 — A bug which caused tail damage during take-off has been fixed. Do 217 E-2 / E-4 — bomb armament modifications order in modifications research tree has been fixed. F.222.2, N.C.223.3, MB.162, LeO 451 early/late — The display of turret armament modification icons has been fixed. Pe-2 (all modifications) — Ammo load of the lower turret with UBT MG has been fixed - ammo load has been increased from 200 to 230 rounds. Hs 129 (all modifications) — Pilot cockpit armour has been fixed. F8F (all modifications) — armoured glass thickness has been fixed. Spitfire F Mk.22 / 24 — Hispano MK V replaced with Hispano MK II. F-86F-2 — tracer rounds display has been fixed. AH-1G — camera position for third person view has been fixed. AH-1Z — camera position for third person view has been fixed. Colt Mk.12 Mod 3 — bullet velocity has been fixed. Ho-103 and Ho-104 MGs — Ammo belt filling has been fixed. For the SS.11 and AGM-22 guided missiles, the armour-piercing value has been changed from 500 to 600mm. The warnings about launching "air-to-air" missiles have been disabled in the SB game mode. Wellington (all modifications), C.R.42 - a bug where it was impossible to cool engines after overheating has been fixed. Mosquito (all modifications) - fuel tank use order has been fixed. First, the tanks on the wing tips are used, then in the central part of the wing, and lastly the tanks in the fuselage. IL-2 (1941, 1942), IL-2М (1943) - FM has been completely changed. Fins and wings polars have been recalculated and updated. Centre of gravity has been recalculated depending on load and amount of remaining fuel. Propeller performance updated. A7M1/M2 - Propeller performance recalculated. Polars of the prop, fins and fuselage completely updated. Maximum speed at ground level and low altitude has been increased (details in the data sheet). Thermodynamics updated. Reactive moment is now more noticeable in full controls mode. A-36 - Rudder response curve has been corrected according to reports (yaw at high speeds reduced). Meredith effect for radiators has been set similar to that of other Mustangs. Wing polars have been recalculated. WEP has been increased; now, 100% throttle has the same power that WEP previously had. Cruise mode added. Modern thermodynamics system added. Engine start and stop modes tuned: propeller spin-up at ground level and in a dive updated. Pitching is possible if brakes are used. CR.42 — The rudder response curve at low speeds has been improved. Stability in cruiser modes improved. Pitching is possible if brakes are used. Engine start and stop modes tuned: propeller spin-up at ground level and in a dive updated. Characteristics of all naval 40mm Bofors have been updated depending on the mount type. A bug where there was no distance correction after firing rounds with a time fuse has been fixed. All naval guns where different crew members are responsible for vertical and horizontal guidance, as well as all turrets that are rotated by a single crew member, can now be guided in both dimensions simultaneously. Ship shells armour penetration table sheets have been expanded in their respective in-game cards. All naval rockets and jet bombs have been corrected in terms of traction, speed and acceleration. The missile sight on ships has been fixed. Now you are able to aim using it. Armour-piercing shells have been removed for German 88, 105 and 127 mm cannons. Costs (SL, GE and RP) for modification research have been compensated. Instead, there will now be HE shells with a tail fuse available for research for 105 and 127 mm cannons, as well as anti aircraft HE shells. Also, 88 mm cannons now have high-explosive fragmentation incendiary shells. German 150mm KC/36 and SK C/25 cannons now have anti-aircraft HE shells. The "Smoke screen" modification has been moved from the 4th to 2nd level and from the "Firepower" section to the "Unsinkability" section. The rigid research sequence of researchable shells and belts has been removed to allow for greater flexibility with player selection. Many armour-piercing and HE shells with a bottom fuse have been moved down to a lower level for quicker opening in the modifications window (for example from level 3 to level 2, etc.). The arming and fusing parameters for the shells with radio fuse have been setted correspond to the historical data. МО-4 — Rudder area increased. Modification "rocket launcher" has been moved to the 4th level. PGH-2 — Gun recoil has been added for the Bofors. Camera position whilst zooming in 3rd person view has been fixed (vessel model no longer disappears). Brave Class (P1011) — X-ray model of the Bofors guns has been fixed. TS-Boot Proj. 206, Pr. 206, Pr. 206М — radar animation added. MBK pr. 186 (МК 85) —AA turrets repair issue has been fixed. MBK pr. 186 —AA turrets repair issue has been fixed. Barbette armouring added. Sumner (DD-692) — Bridge x-ray model fixed. The location of the ammunition has been corrected..
Clemson (DD-336), Clemson (DD-213) — Lifeboat model changed. X-ray model changed for the 11th and 12th torpedo in torpedo launchers. Tashkent (destroyer leader) — Vessel draft in the hangar updated. Fume effect added. BMO — 21-К Gunner position has been changed. Bennion (DD-662) — The damage model of the front and rear fuel tanks have been updated. More elevators have been added. Ammo allocation updated. Cowell (DD-547), Fletcher (DD-445) — The damage model of the front and rear fuel tanks have been updated. More elevators have been added. S-100 Lang, S-100 (1945) — Camera position after joining a battle has been fixed. S-100 (1944) — A stabilizer has been added for the MK103. USS Trenton (CL-11), USS Raleigh (CL-7) — Max speed has been updated from 32.6 knots to 34 knots. 89 ft PT-810 — MK2 gunner model has been fixed. Depth charges model x-ray has been fixed. Stabilizer has been added for the Mk.3 with 40mm Bofors. Fairmile D (5001), Fairmile D (697), Fairmile D (617) — Main calibre gun now has 360 degrees of rotation. Class Dark (FPB 1101) — Visual discrepancy of the shaft axes for the 115 mm canon in X-ray view has been fixed. VS-10 — illuminator glass removed from armour model of the vessel. Vosper 1 series — Coaxial MG reload time has been changed from 10 to 8 seconds. Pr. 123К «Komsomolets», Pr. 123К (А-11) — Prices for DShK ammo belts are now equal to each other. Krasny Krym — X-ray model of the rear main calibre gun has been fixed. Krasny Kavkaz — The 180mm B-1-K has received new ammo: semi AP PB-32 and AA grenade ZS-32 with time fuse. Elco 80 ft PT-556 Thunderbolt — A bug where there was no indication of the auxiliary caliber gun’s ammo has been fixed. Köln — Modifications of the 88mm gun ammo have been fixed. Nose magazine position has been updated. LCS(L)(3) — Amount of rounds per barrel of the Bofors has been increased. SGB (S304) — Ammo load of the 40mm guns has been fixed. Previously it was equal to the amount of ammunition of one reload, so the gun wasn't fully loaded. Instead of 2000 shots for each barrel it is now 1960 which corresponds to 35 magazines. Vosper 2 series — Ammo load of the 20mm guns has been fixed. Previously it was equal to the amount of ammunition of one reload, so the gun wasn't fully loaded. Instead of 2000 shots for each barrel it is now 1980 which corresponds to 33 magazines. HMS Leander — A bug with one of the engine rooms being invulnerable has been fixed. Asheville (PGM-84) — A stabilizer has been added for the mk3 mount with the 40mm Bofors. Elco 80 ft PT-314 — A stabilizer has been added for the 37mm м4. Elco 77ft PT-59 — Visual divergence of the 40mm Bofors barrels axes in x-ray mode has been fixed. Z-20 Karl Galster — an issue with 37mm guns guidance has been fixed. Visual x-ray model of a torpedo tube has been fixed. Type 1939 (T22) — an issue with 37mm guns guidance has been fixed. Visual model of the vessel has been fixed. Kanonenboot K-2 — an issue with 37mm guns guidance has been fixed. Magazines positions have been updated. HMS Dido — Visual divergence of the main calibre gun axes barrels in x-ray mode has been fixed. Mk.13 torpedo - incorrect modifications have been removed. The order of starting torpedoes on the S-38 in the x-ray view of the vessel has been fixed. F-86F-2 — Has been moved to rank 6. F9F-8 — Has been moved to rank 6. FJ-4B — Has been moved to rank 6. FJ-4B VMF-232 — Has been moved to rank 6. CL-13A Mk.5 — Has been moved to rank 6. MiG-17 — Has been moved to rank 6. Hunter F.1 — Has been moved to rank 6. F-86F-40 (Japan) — BR has been changed: for AB - from 8.0 to 8.3, for RB and SB - from 9.0 to 9.3. F9F-2 and F9F-5 — Have been grouped in the aircraft research tree. Me 262 C-1a and Me 262 C-2b — Have been grouped in the aircraft research tree. Yak-17 — Has been grouped with the Yak-15. MiG-15 and MiG-15bis — Have been grouped in the aircraft research tree. Meteor F Mk.4 G.41F and Meteor F Mk.4 G.41G — Have been grouped in the aircraft research tree. Pr. 159 — Has been moved to rank 2. Type-90 — Has been moved to rank 7. Connections between the Soviet, US and German ground vehicle research trees have been added. Premium ground vehicles Т-55АМ-1, Leopard A1A1 (L44), XM-1 (C/GM) and Sho’t Kal Dalet have been moved to the rank 6. Purchase costs in SL for some rank V Soviet, US and Japanese aircraft has been decreased. The purchase costs for crew qualification on the destroyer Leningrad has been reduced. A set of icons depicting maritime crew has been added. A "Deforming Tricolor Pattern" for Soviet top ranked ground vehicles has been added. Some decals from the "identification marks" group are no longer free. Additional tasks to receive them and the opportunity to purchase them for the GE have been added. The colour of the basic camouflage for the Type 60 SPRG and Type 61 has been changed. Z-20 Karl Galster — Instead of two decals, a skin with images of is current flags on its deck has been added. This made it possible to free two slots for decals on the ship. The decals themselves remain available in the set. F-100 — Two additional camouflages have been added. Information about structural material and the thickness of the hull and superstructures has been added to the ship's card. Information regarding earned medals has been added to the player info cards. Radar station mechanics for ground vehicles and aircraft have been added. Field repair mechanics have been updated in ground forces RB. Field repair will now be carried out only in the absence of an installed "Parts" modification and must be activated manually. The possibility of a complete breech failure of a tank’s cannon when it fires with a damaged breech has been added. In order to continue firing after a complete failure, the breech will need to be repaired the regular way via field repair. Mechanics for suspension damage on wheeled ground vehicles has been implemented. A bug related to the "Base defender" award has been fixed. In order to receive it, it is necessary to destroy the enemy who is capturing the point and thus halt the progress of capture (it means that the enemy must be the only player at the point). AIs which are controlling ground vehicles (will be used in custom battle missions and battles for beginners) can now use the FPE modification. In the "Assault: Tank arcade" mode, AI ground vehicles can now use the "Parts" modification to repair vehicles instead of the automatic repair made by the mission script and FPE modification. New achievements for Italian ground forces have been added. In AB and RB, the timer and sound signal by fall the shell into the water has been added. The ability to turn on/off the audio signal in the game menu (menu > options > main parameters > naval battle settings) has been added. The minimum calibre at which the system operates is 76 mm. The colour of the smoke at a captured point is now coloured in the colour of the team that controls it. 125mm 3BM22 - Penetration values updated. Source: Вестник Бронетанковой Техники №12/1991г. Т-64А, Т-72А - 3BM15 replaced with 3BM22. 3BM12 replaced with 3BM15. C1 Ariete - A bug with impossibility of shifting to second reverse gear has been fixed. Maximum power RPM has been changed from 2200 to 2300 rpm. For AS-20 and AA-20 Nord missiles the launch has been fixed to missiles "air-to-ground". Research cost for the modifications "Parts" and "FPE" for rank 7 ground vehicles have been reduced. A bug where the M4A3E2 (76) W exhibited the 75 mm M3 gun model, rather than the 76 mm М1, has been fixed (source). Sea Hawk Mk.100 - a bug with secondary armament has been fixed. Type 74, Type 74G - textures of the attached elements have been fixed. Chieftain Marksman - radar allocation on the model has been fixed. A bug in naval battles where it was impossible to mark a target and also fire at a distance over 10 kilometers has been fixed. Challenger 2 - ESS (engine smoke generating system) modification has been added. Condition required for "Piccadilly Lilly II" pin-up decal has been added. He 219 A-7, Do 217N-1, Do 217N-2 — A bug that caused performance issues when turning on the radar station on these aircraft has been fixed. A bug where the illumination in the night battles doesn't come from the moon but from the position of the sun has been fixed. A bug where AI controlled guns in naval battles in some cases fired at shorter range than the distance to the intended target has been fixed. A bug where when hovering over the helipad the hint "Landing" has been shown multiple times has been fixed. A bug where specific key combinations in controls caused conflicts between other control settings has been fixed (source 1, source 2). A bug in ground battles where the sound of a machine gun could get stuck, has been fixed. mass has been changed from 6.8 to 6.2 kg. speed has been changed from 423 to 540 m/s. Source: H.Dv.119/324: ﻿Schußtafel für die 7,5﻿cm KwK40 und 7,5cm StuK40 und die 7,5cm PaK40. Type 89 — The coaxial machine gun model has been changed from M240 to Type 74. 90/53 M41M — A bug where only 3 crew members were taken into account instead of 4 has been fixed. Light Armored Car M8 — The thickness of the engine-transmission section has been changed from 50 to 6mm. Т-80U — The mass of the vehicle has been changed from 42.5 to 46 tons. Source: Сайт Министерства Обороны РФ // Основной боевой танк Т-80 Рощин С.
Ka-Mi — The mass of the vehicle has been changed from 10.9 to 9.07 tons. Source: Japanese Armoured Troops, April 1945. Sherman VC Firefly — The mass of the vehicle has been changed from 30.6 to 35.3 tons. The mass of the additional armour has been changed from 950 to 1805 kg. Maximum speed has been changed from 41 to 35 km/h. Source: Sherman I, II, III & V Drawing No: TD.25968, The National Archives WO 194/132 // T.D.25968 * Sherman I-V Track Links Drawing. PT-76B, Object 906 — ESS (engine smoke generating system) modification has been added. M50 Ontos — The sight magnification has been refined. Current magnification is 6х. Source: Technical Manual TM 9-500 Data Sheets for Ordnance Type Materiel Headquarters, Department of the Army September 1962. Т-55АМ-1 — The sight magnification has been changed to 8x as previously, in addition to the main sight, the 1K13 sights with this magnification were used for ATGM aiming. Source: Руководство по материальной части и эксплуатации танка Т55 // Танк Т-55АМ — Дополнение к техническому описанию и инструкции по эксплуатации танка Т-55. M60, M60A1 (AOS) — Sight magnification has been corrected from variable values of 6.7x - 8x to a fixed 8x. Source: TM 9-500, Department of The Army, 1954, Page 84A, 84B. Crusader Mk.III — a bug with front turret thickness has been fixed. Previously the armour consisted of two plates of 30 mm each. Now the external plate is 31.7mm and the internal one is 19mm Source: Crusader Drawing No: TD.5911. M8 Scott — a bug where the gun elevation in the front has been limited to -10° instead of -20° has been fixed. Т95Е1 — The RPM engine bug has been fixed when in RB mode RPM could not accelerate beyond 1900. TAM — Max RPM values have been decreased from 2600 to 2400. Source: Vehiculos Blindados Del Ejercito Argentino 1 - VC TAM. Vehiculo de Combate Tanque Argentino Mediano, Diego F. Rojas. Jagdpanzer 38(t), Jagdpanzer IV (L/48) — smoke grenade added. Source: Merkblatt 47b/45 - Bedienungs- und Schießanleitung für die le. Panzerjäger IV﻿ und 38 t m﻿﻿it der 7,5 cm Pak 39﻿﻿. Vom 2﻿4.06.19﻿44. Marder III H, Sd.Kfz.234/4 — smoke grenade added. Source: H.Dv.119/324: Schußtafel für die 7,5cm KwK40 und 7,5cm StuK40 und die 7,5cm PaK40. Leopard 2К — Stereoscopic rangefinder has been replaced with laser rangefinder.Source: Carl Zeiss Archive Image, Sigantur: SO B 3123, Title: "Entfernungsmessgerät EMES 12 (TEM 4A), 8fach und 16fach kombiniert mit Laser-Entfernungsmessgerät in Anwendung" // Waffensysteme Leopard 1 und Leopard 2 - Vollst. überarb. und erg. Aufl., Walter J. Spielberger. vz.37 designation changed to MG37(t). M22 - “Airstrike” and “Improved optics” modifications have been removed as the vehicle is 1st rank. In air mission [Ruhr] base destruction logics have been updated. The airfields are no longer targets for bombers, and the bases will reappear 2 minutes after they are destroyed. MiG-19 (all modifications) — in mouse-aim mode, the rudder’s response has been improved at high speeds. A bug where there were no interface sounds (while selecting an option in the menu, changing options, or pressing a button) has been fixed. A bug where ULQ video settings in the April Fool's event "Earth Thunder" caused client crashes has been fixed. A bug where no Prandtl–Glauert singularity effect was being displayed on specific SLI graphic cards has been fixed. A bug where antialiasing was not working on specific SLI graphic cards has been fixed. In the Earth Thunder event, the main gun spread below the water surface has been fixed. A bug where tracers would appear to be too thin has been fixed. A bug where there was no sound (buzzing) being played for missile homing lock has been fixed. A bug where ground vehicles with shoulder-guiding had the sound of a stabilizer being played has been fixed (source). A bug where high ping created some issues in controlling a vehicle has been fixed (source). "Locked on! I" tab added in the workshop for console users to allow the exchange of items gained from trophies. A bug where it was impossible to change the rate of fire on ground vehicles has been fixed (source). A bug where a player was unable to complete the Dynamic campaign in a squad has been fixed. A bug which would occur when switching to the optical sight, stopping the player from controlling the vehicle by using mouse aiming, has been fixed. Sho’t Kal Dalet - a bug where the M111 APFSDS ammo was counted as default and free has been fixed. From now on, the HEAT shell is the default. The M111 costs 400 Silver Lions. A bug occurring when respawning in an aircraft, where players would see the message “Your flying speed is too low. Increase throttle to avoid a crash” has been fixed. SA.342M Gazelle — A bug which would occur when activating the button for heat flares, where players would see the message “Out of flares” even though the vehicle is incapable of having them installed, has been fixed. A bug where a helicopter’s altimeter displayed incorrect values whilst flying above water has been fixed. A bug where a non-functioning “Order” button was displayed in the preview window for event vehicles has been fixed. A bug where in the “Shop” drop down menu the “Workshop” button was displayed even when a player did not have access to the "Workshop" has been fixed. This page was last edited on 17 April 2019, at 02:59.